In January 1980, during Japan’s first gold boom, gold hit an historical high above the 6,000 yen per gram mark, after which each month witnessed a sharp decline—to 5,000 yen, then 4,000 yen, and so on. 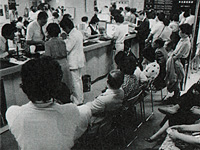 Many customers came to us for advice: “When will it break through the 3,000 yen mark?” or “How far should it fall before I should buy?” Over the next ten months from January 1981, the decline continued down to the 3,000 yen mark, to drop finally on November 17 to 2,990 yen per gram. Of course, people believed then to be the ideal time to buy so the bullion business was rushed with orders as Japan’s second gold boom got under way. Long queues of people eager to buy gold formed at our retail shops as well, with lines 100 meters long still waiting at 5pm when final orders were taken. They did not accept that advice though and on one day we sold as much as four tons of gold. As a result, we were almost out of stock of our most popular 100-gram gold bars and we even had to make do at times with just an exchange order. Back in 1979, excise duty on gold bullion currency transactions was 15% (where retail price was 25,000 yen or higher). 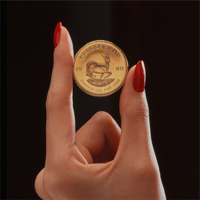 The Krugerrand was the first to arrive in Japan, but it was only available as expensive 1 ounce coins at the time, to which excise duty was payable as well, so there was some uncertainty about whether the market would accept the coins. For this reason, the market was initially tested with a lower value, tax exempt coin issued by the same South Africa. The response was so excellent that we reported back to the International Gold Corporation (InterGold), the company wanting to release the Krugerrand in Japan that they would have to develop a smaller tax exempt Krugerrand coin. With the price of gold continuing to rise, InterGold soon got back to us to say they could issue 1/2 ounce, 1/4 ounce and 1/10 ounce gold coins especially for Japan. At the time, the 1/10 ounce gold coin didn’t attract the tax. Therefore in November 1980, we signed an exclusive agency agreement with InterGold and went on to develop the gold coin market here. However, before we could actually begin selling the coins in Japan, we had to overcome many problems. One of them was a difference of opinions between TANAKA and InterGold about sales strategies. On October 1, 1945, soon after the end of the war, the General Headquarters of the Allied Powers (GHQ) began confiscating precious metals. The following excerpts from documents at the time, still kept by us, shows a little of what it was like back then. Like everyone else at the time, food was scarce for us. Instead of seized gold, silver and other metals, we ended up storing sweet potatoes in our strong room. Of course there was no real work available, so even when our staff came to the office they just hung around doing nothing in particular. Selling off our machines and land, we were finally able to pay them. This continued for a number of years after the war, beginning the darkest of days for the precious metals industry as well.